Groundwater aquifers are important sources of water for agricultural, municipal and household use across the world, sustaining one-fourth of the human population (Ford and Williams, 1989). It is estimated that there are more than 390 million acre-feet of groundwater in Oklahoma, most of which is held in the state’s 22 major aquifers (see Extension Fact Sheet WREC-104, “Introduction to Groundwater Hydrology and Management.”). These aquifers supply nearly half of all water used in Oklahoma and more than 70 percent of water used for agricultural irrigation (Oklahoma Water Resources Board, 2014). To sustainably manage groundwater resources, it is necessary to know an aquifer’s recharge rate, or the rate at which water is being returned to the aquifer. Understanding an aquifer’s recharge rate allows water managers to know whether more water is being returned to or lost from the aquifer, either by pumping or by natural discharge. Rates of groundwater loss often exceed the rate of recharge due to excessive pumping or drought, which causes water levels in aquifers to drop. 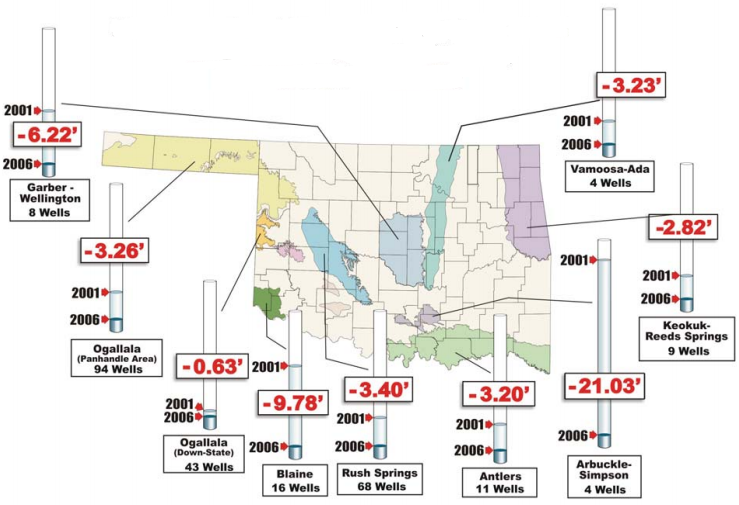 This disparity between recharge rates and groundwater losses led to water level declines during 2001-2006, ranging from 0.6 to more than 21 feet in many major Oklahoma aquifers, as shown in Figure 1. Figure 1. 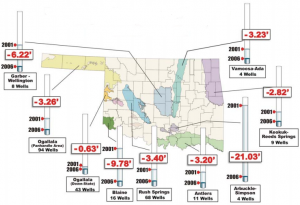 Water-level declines in Oklahoma aquifers from 2001-2006. Source: Oklahoma Water Resources Board, 2007. Many prior studies have estimated recharge rates for individual Oklahoma aquifers (Table 1). However, factors such as data availability, climate during the study period (i.e., wet vs. dry conditions) and the duration of the study (i.e., short vs. long-term) can impact study results and can make comparing recharge rates between studies difficult. In contrast to aquifer-specific studies, very few state-wide estimates of groundwater recharge have been made. The most recent state-wide recharge rates were published nearly 40 years ago (Pettyjohn et al., 1983) (Figure 4). Because of the importance of groundwater in the state, accurate and up-to-date recharge rates are essential for the sustainable management and longevity of groundwater resources. Table 1. Summary of previously published recharge rates for select Oklahoma aquifers. Source: Oklahoma Comprehensive Water Plan 2012 Executive report. Groundwater recharge is often limited by the amount of water that drains from a soil profile, and the drainage rate is strongly influenced by soil moisture conditions. Because drainage limits the amount of recharge an aquifer may receive, it is helpful to think of the drainage rate as a potential recharge rate, or as an upper limit on actual recharge. Assuming water flow in soil is gravity-driven, it is possible to estimate the amount of drainage from the soil profile using soil moisture data from monitoring stations and soil property data. The Oklahoma Mesonet has provided daily soil moisture data at three depths (2 inches, 10 inches and 24 inches) for more than 100 stations since 1996 (Figure 2). These data were used to estimate annual drainage at 78 locations from 1998-2014 (Figure 3). Using soil moisture data to estimate drainage rates has three distinct advantages over previous methods: 1) it incorporates long-term meteorological and soil moisture data that have been collected since 1996, including the effects of several extreme climatic events, 2) results can be updated any time as long as the soil moisture monitoring system is intact and 3) in addition to site-specific estimates of drainage, the large number of point measurements available may be used to indicate the spatial distribution of recharge across the entire state of Oklahoma, as opposed to single-aquifer studies that have been done in the past. Figure 2. Mesonet site name abbreviations and locations for sites where drainage estimates were made. Labels for three sites (Stillwater, Marena and Oklahoma City East) were excluded for clarity. Adapted from Wyatt et al. (2017). Figure 3. Statewide mean annual soil moisture-based drainage rates for the years 1998-2014. Drainage rate labels for the Stillwater, Oklahoma City East, Porter, and Marena sites were excluded for clarity, but were 8.4, 3.2, 6.5 and 2.6 inches per year, respectively. Figure 4. Prior state-wide groundwater recharge estimates published by Pettyjohn (1983). year. The median drainage rate for the study period was 2.64 inches per year, which is approximately 7.7 percent of the median state-wide rainfall of 34.3 inches per year for the same period. This means, on average, approximately 8 percent of rainfall falling in Oklahoma became drainage from 1998-2014. Soil moisture based drainage rates correspond fairly well with the most recent prior state-wide estimates of groundwater recharge (Figure 4). Although Pettyjohn et al. (1983) used a different method and data from the 1970’s, the maps are similar in several ways, including the trend that drainage and recharge rates decrease from east to west. Additionally, the maximum soil moisture-based drainage rate in this study (10.5 inches per year) and maximum Pettyjohn et al. (1983) recharge rate (10 inches per year) are comparable. However, there are also some differences between the two maps. For instance, calculated drainage rates in the Oklahoma Panhandle range from 0.2 to 1.1 inches per year and are higher than the recharge rate of 0.1 inch per year or less estimated for this region by Pettyjohn et al (1983). Soil moisture-based drainage estimates summarized by aquifer compare well with previous recharge estimates for major Oklahoma aquifers (Table 2). 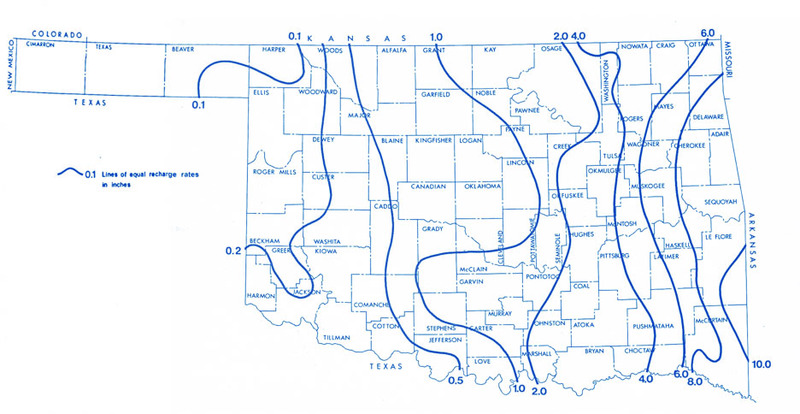 These drainage values were found by computing the median value of the mean annual drainage rate for aquifers with a minimum of three Mesonet sites above them, resulting in aquifer-scale drainage rate estimates for six Oklahoma aquifers. Aquifer-scale drainage rates fall within the range of previous recharge estimates, with the exception of the Arkansas River alluvial aquifer, which has only one prior recharge estimate. Though only one other study has estimated recharge for the Arkansas River alluvial aquifer, the soil moisture-based drainage estimate is within 30 percent of the estimated recharge rate found by that study. These results provide strong evidence that drainage estimates from a large-scale soil moisture monitoring network can be indicative of potential recharge rates at the spatial scales of an individual aquifer and an entire state. Table 2. Summary of soil moisture-based drainage rates by aquifer. Aquifer name, number of Mesonet sites located above the aquifer, median value of the mean annual soil moisture-based drainage rate, a range of previous recharge estimates, and the number of publications contributing to that range. a Czarnecki et al. (2009); Dugan & Peckenpaugh (1985); Imes (1989); Imes and Emmett (1994). b Oklahoma Water Resources Board (2012). c Pettyjohn and Miller (1982); Mashburn et al. (2014); Parkhurst et al. (1996); Oklahoma Water Resources Board (2011). d Becker and Runkle (1998); Tanaka and Davis (1963); Pettyjohn et al. (1983); Oklahoma Water Resources Board (2012). e Oklahoma Water Resources Board (2012); Hart and Davis (1981); Morton (1992). f Luckey and Becker (1999); Hart et al. (1976); Morton (1980); Oklahoma Water Resources Board (2012). Soil moisture-based drainage estimates can be made by applying a simple unit-gradient assumption to daily soil moisture data from long-term in situ monitoring stations. The primary weaknesses of this approach in the present study were: 1) the relatively shallow measurement depth used (i.e., 24 inches) and 2) the increased uncertainty in the drainage estimates for wetter sites. Despite these weaknesses, the results provide evidence that, in many cases, the drainage rates at 24 inches are estimated with reasonable accuracy and that these drainage rates are indicative of potential groundwater recharge rates. Spatial patterns of the estimated drainage rates tend to follow the state’s precipitation gradient, decreasing from east to west. Additionally, aquifer-scale drainage rates compared well with previous estimates of recharge in all available cases. 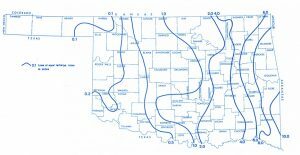 The maps of mean annual drainage rates across the state of Oklahoma, yearly drainage and other maps related to soil moisture conditions in Oklahoma, are available online at http://soilmoisture.okstate.edu under the “Projects” tab. 1. Long-term soil moisture data, such as those available from the Oklahoma Mesonet, may be used in conjunction with soil property data to accurately estimate drainage rates from the soil profile. 2. These soil moisture-based drainage rates range from 0.2 inch to 10.5 inches per year for the years 1998-2014 and are indicative of potential recharge rates to underlying groundwater aquifers. 3. Estimated drainage rates compare well with estimates of recharge from many prior studies in Oklahoma and may be useful for water users, resource managers and decision makers. Becker, M. F. and D. L. Runkle. 1998. Hydrogeology, water quality, and geochemistry of the Rush Springs aquifer, western Oklahoma. US Geological Survey, Water Resources Division; Branch of Information Services. Czarnecki, J. B., J. A. Gillip, P. M. Jones, and D. S. Yeatts. 2009. Groundwater- flow model of the Ozark Plateaus aquifer system, northwest Arkansas, southeastern Kansas, southwestern Missouri, and northeastern Oklahoma. U.S. Geological Survey Scientific Investigations Report 2009-5148: 62p. Dugan, J. and J. Peckenpaugh. 1986. The effects of climate on consumptive water use and ground-water recharge in parts of Arkansas, Colorado, Kansas, Missouri, Nebraska, Oklahoma, South Dakota, and Texas. U.S. Geological Survey Water-Resources Investigations Report: 85-4326. Ford, D.C., and P.W. Williams. 1989. Karst geomorphology and hydrology. Unwin Hyman, London. Hart, D. L. and R. E. Davis. 1981. Geohydrology of the Antlers aquifer (Cretaceous), southeastern Oklahoma, University of Oklahoma Press. 81. Hart, D. L. Jr., G. L. Hoffman, and R. L Geomaat. 1976. Geohydrology of the Oklahoma Panhandle, Beaver, Cimarron and Texas Counties. U.S. Geological Survey Water Resources Investigation 25-75. 72p. Imes, J. L. and L. F. Emmett. 1994. Geohydrology of the Ozark Plateaus aquifer system in parts of Missouri, Arkansas, Oklahoma, and Kansas. U.S. Geological Survey Professional Paper 1414-D. 127p. Imes, J. L., 1989. Analysis of the effect of pumping on groundwater flow in the Springfield Plateau and Ozark aquifers near Springfield, Missouri: U.S. Geological Survey Water Resources Investigations Report 89-4079, 63p. Kim, J. H. and R. B. Jackson. 2012. A global analysis of groundwater recharge for vegetation, climate and soils. Vadose Zone J. 11. doi:10.2136/vzj2011.0021RA. Luckey, R. L. and M. F. Becker. 1999. Hydrogeology, water use, and simulation of flow in the High Plains aquifer in northwestern Oklahoma, southeastern Colorado, southwestern Kansas, northeastern New Mexico, and northwestern Texas. U.S. Geological Survey, Water Resources Investigation Report 99-4104. Mashburn, S. L., D. W. Ryter, C. R. Neel., S. J. Smith, and J. S. Magers. 2014. Hydrogeology and simulation of groundwater flow in the Central Oklahoma (Garber-Wellington) Aquifer, Oklahoma, 1987 to 2009, and simulation of available water in storage, 2010–2059. U.S. Geological Survey, Water Resources Investigations Report 2013-5219. Morton, R. B. 1980. Digital-model projection of saturated thickness and recoverable water in the Ogallala aquifer, Texas County, Oklahoma. U.S. Geological Survey Open-file Report 79-565. 34p. Morton, R. B. 1992. Simulation of ground-water flow in the Antlers aquifer in southeastern Oklahoma and northeastern Texas. US Department of the Interior, U.S. Geological Survey Water Resources Investigation. Oklahoma Water Resources Board (OWRB). 2007. Oklahoma Water News Quarterly Report. Oklahoma Water Resources Board (OWRB). 2011. Oklahoma Comprehensive Water Plan Physical Water Supply Availability Report. Oklahoma Water Resources Board (OWRB). 2012. Oklahoma Comprehensive Water Plan 2012 Executive Report. Oklahoma Water Resources Board (OWRB). 2014. http:// www.owrb.ok.gov/util/waterfact.php. Accessed Jan 20, 2019. Parkhurst, D. L., S. C. Christenson, and G. N. Breit. 1996. Ground-water-quality assessment of the central Oklahoma Aquifer, Oklahoma: geochemical and geohydrologic investigations. U.S. Geological Survey Water Supply Paper 2357-C. 101p. Pettyjohn, W. A. and A. Miller. 1982. Preliminary estimate of effective ground-water recharge rates in central Oklahoma. Oklahoma Water Resources Research Institute. Pettyjohn, W.A., H. White, and S. Dunn. 1983. Water Atlas of Oklahoma. University Center for Water Research, Oklahoma State University, Stillwater, OK.
Scanlon, B. R., R. W. Healy, and P. G. Cook. 2002. Choosing appropriate techniques for quantifying groundwater recharge. Hydrogeol. J. 10:18-39. Tanaka, H. H. and L. V. Davis. 1963. Ground Water: Rush Springs Sandstone. Norman, Oklahoma: Oklahoma Geological Survey, Circular 61. Wyatt, B.M., T.E. Ochsner, C.A. Fiebrich, C.R. Neel, and D.S. Wallace. 2017. Useful drainage estimates obtained from a large-scale soil moisture monitoring network by applying the unit-gradient assumption.Vadose Zone J. doi: 10.2136/vzj2017.01.0016.